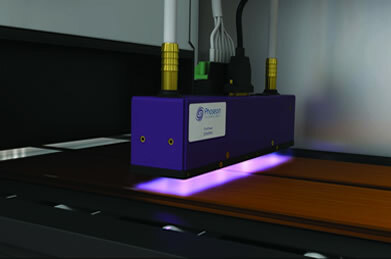 Phoseon says its UV LED curing systems reduce operating costs and increase productivity when compared to UV arc lamps. The findings are listed in the report, UV LED Curing for Wood Coatings which includes a detailed cost of ownership study conducted with Robert Bürkle GmbH. In the report, Bürkle was able to demonstrate savings of €10,000 ($13,367 U.S.) annually per 1.4M UV LED lamp. Energy costs accounted for approximately 60% of the total savings savings. The UV LED curing systems also led to a 5% improvement in yield, a 50% reduction of air extraction volumes and an 80% reduction in down time associated with repair and maintenance. Phoseon says UV LED technolgy allows users to cure a variety of heat-sensitive substrates that have previously been unusable with traditional UV arc lamps. The Phoseon FireJet, which can scale to cover any conveyor width, produces an intense output which enables end users to run production lines at maximum speeds. Even with the intense UV output, Phoseon says the FireJet uses only a fraction of the power used by comparable UV arc lamps. Phoseon's UV LED curing applications are also used to dry inks, coatings, adhesives and other UV-sensitive materials.